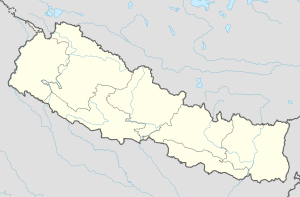 Sarangkot is a former Village Development Committee west of Pokhara in Kaski District Gandaki Zone. In 2015, it was annexed to Pokhara 26. At the time of the 1991 Nepal census it had a total population of 5,060 with 1,010 individual households. The village is located on Sarangkot mountain at an altitude of 1600m and is renowned for its panoramic Himalayan views Dhaulagiri, Annapurna and Manaslu as well as down on the city of Pokhara and Phewa lake. In recent years, Sarangkot has become a hotspot for paragliding. To promote local culture, Sarankot has one FM radio station Radio Sarangkot - 104.6 MHz Which is a Community radio Station. ^ "Nepal Census 2001". Nepal's Village Development Committees. Digital Himalaya. Retrieved September 30, 2008. Wikimedia Commons has media related to Sarankot.